This book is sold in the soccer section, but the content is more about the violence. Violence connected with soccer in the eighties in England. It is not a book for subtle nature humans. It is dirty, aggresive and stupid. The same like the hooligans are. This review was originally published at allmybooks.org, the site devoted to good books and their reviews. Unfortunately, the site is no longer online. They gave us permission to republish soccer books reviews. 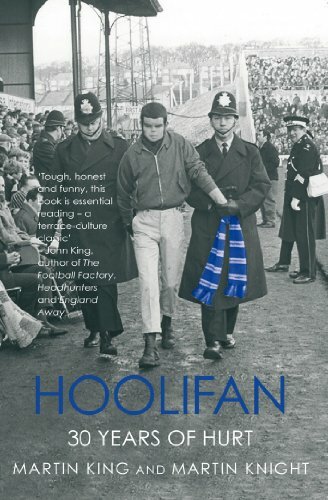 A book about the real life of one real hooligan fan of Chelsea London. The author writes about his life career which starts as “normal” fan and ends as one of the leaders of football hooligans. Martin King, the author, was one of the hooligans and do not have any remorses. Martin Knight, the co-author, lived the similar life like King, and sometimes has some remorses. And the name of the book says a lot. Authors do not see themselves as hooligans, but they see themselves as football fans, who sometimes made some mess. Hoolifans. The book is not really a masterpiece. Some parts are good, some not as good from a literature point of view. Authors are not writers and you can see that. Some pieces of their memories do not stick together. You will have a problem to find out what authors would like to say. Every person has a selective memory and sees his past in a more friendly way. And you can see it also in this book. Authors are trying to excuse their former life and derogate their fights like the way of entertainment with other fans from opposite clubs. It is a pity, that they negate their claims on other pages of their book. Stories about attacks on passerby are not funny and it is not entertainment you will like. The base of all and everything is football and club. But in reality, they do not follow the match. It is not about football. It is about fights and attacks. They hardly stayed till the end of any match they visited. You can hardly find any description of nice goals or other football moments in this book. This book gives you a chance to understand where the football hooliganism started. Where are its roots and how you can suppress it? Football was always entertainment of poor factory workers. Moreover, strict rules about drinking in England (last drink at 11 p.m.) did not help either. Speedy drinking brings aggressiveness. When you connect these two things you get football hooligan. You belong to someone (to your club, to your fellow fans) and you have to stand for it. You need to get out your aggressiveness. Fights were just another kind of sport for hooligans. As hooligans grew up and started their families, their tendency to look for fights lessen. Another scary thing for every hooligan was a massive police presence with monitoring systems on stadiums. The biggest fear still comes from the possibility that police will enter your house just on behalf of few camera shots taken the previous weekend. The weekend when you were beating the hell out of a fan of the opposite club just for fun. Authors tend to blame newspapers and tv stations from ballooning cases of football hooliganism in the interest of higher selling rates. On other hand, authors admit that to see their pictures in newspapers brought them respect and increased self-confidence. And also after the 6th issue of their not very quality book, they really can not complain about the media world.